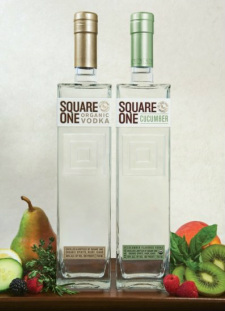 Here is a new product from Square One Vodka in Novato, California, that has pure Organic Vodka and Cucumber infused Organic Vodka. Even though the vodka market is saturated by new products, there is a touch of originality about this entrant, and it may stand a chance to make an impact of sorts. I expect that creative mixologists will have a lot of fun with this one, and we can absolutely advise readers to try Square One for themselves. The cucumber innovation is a recent one, and it is quite a surprise that it took so long for a vodka with cucumber to hit the market. 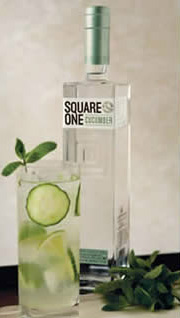 Allison Evanow, a former Jose Cuervo executive and the brains behind Square One had quite a tough time getting the blend right, and the proprietary method has produced a vodka that smells as much of cucumber as it tastes. It is not a heavy vodka, and you can taste the grain despite being rather neutral in flavor. No corn, potato or grapes are used in this Vodka, and the rye used only uses chemical free compost and fresh water from the nearby Teton Range. Rye grown in North Dakota is considered is considered to be one of the best available, and this differs from a lot of American vodkas where the raw ingredients used may contain traces of chemical fertilizers and synthetic toxins to pump up production. The distillation is single, four column continuous with micron paper filtration. She clearly wants Square One to be the innovator and market leader in organic spirits, and intends to give a portion of the after-tax profits of Square One to nonpartisan environmental causes. It is particularly suited to highballs such as a Cucumber Vodka Tonic or Tom Collins, and Evanow has also created “The China Doll,” a blend of Square One Cucumber, ginger liqueur, lemon juice, agave nectar and soy sauce. This one is a natural pairing for Asian-fusion food. She has also paired up Square One with mixologist H.Joseph Ehrmann to create a series of cocktails that go perfectly with Square One Cucumber. Already they have come up with the White Vespa (Square One, dry vermouth and grappa) and the Maravilla (Square One, manzanilla sherry, agave nectar, honey dew melon and kumquat juice). The bottle was designed by Michael Osborne in San Francisco, and the Organic certification is Oregon Tilth.